Image copyright: Copyright expired - public domain. ID number P00348.001 Object type: Black & white. Place made: Pacific Islands: Bismarck Archipelago, New Britain, Rabaul. Date made: July 1941. Physical description: Black & white Collection Photograph. Description: Group portrait of members of the 2/10 Field Ambulance detachment at Rabaul, New Guinea prior to the Japanese invasion. Identified in the back row, from left to right: VX26758 Private (Pte) George William Lanham, 2/22nd Battalion, attached to the 2/10th Field Ambulance as a driver, taken prisoner of war (POW) and died 1 July 1942 after the Japanese transport ship Montevideo Maru was torpedoed off Luzon Island, Philippines; NX57343 Pte Wilkie Desmond Collins, evaded execution and survived; NX57642 Pte Thomas Benjamin Clissold, was executed 4 February 1942 at Tol, New Guinea; NX46687 Pte Ronald Maurice Cantwell, was executed 4 February 1942 at Tol; NX34205 Pte Richard Buck, was executed on 4 February 1942 at Tol; NX45605 Pte Leslie William Fawcett, was evacuated from Rabaul onboard the yacht Laurabada; NX45161 Pte Thomas Webb, was executed 4 February 1942 at Tol; NX33109 Pte William Thomas Ramage, was executed 4 February 1942 at Tol; and VX32827 Pte John George Stanley White, 2/22nd Battalion, attached to the 2/10th Field Ambulance as a driver, died 1 July 1942 after the sinking of the Montevideo Maru. Identified in the second row, from left to right: NX65305 Pte Harold William Galloway, executed 4 February 1942 at Tol; NX19620 Pte Albert Fernandez, died 1 July 1942 after the sinking of the Montevideo Maru; NX56978 Pte William Cook, survived the Tol massacre and was evacuated from Rabaul onboard the Laurabada; NX27623 Pte William Henry Harrison Wells, died 1 July 1942 after the sinking of the Montevideo Maru; NX32404 Pte Cecil Buck (brother of Pte Richard Buck) was executed 4 February 1942 at Tol; NX47097 Pte Roger Miller Attwater, was executed 4 February 1942 at Tol; NX55720 Pte George Alexander Smith, left Rabaul with two patients before the Japanese attack; and NX35227 Pte Reginald Maxwell Langdon, stayed at the Army Hospital in Vunapope and was later executed on 1 July 1942. 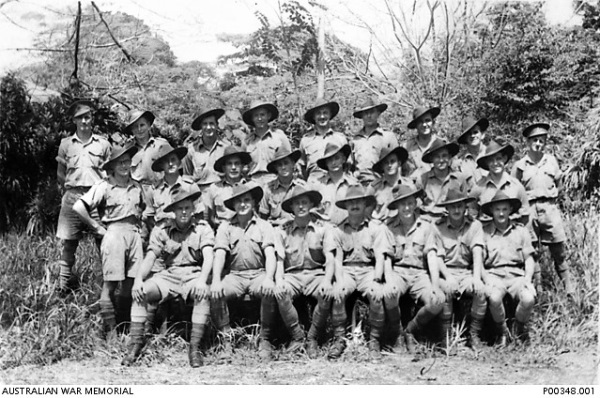 Identified in the front row, from left to right: NX59095 Lance Corporal (L Cpl) John Maxwell Holah, evacuated from Rabaul onboard the Laurabada; NX65306 Sergeant Gordon Ross Hudson, executed 4 February 1942 at Tol; NX35101 Captain Sandy Edwin John Robertson, held as a POW in Japan; NX35096 Major Edward Charles Palmer, evacuated from Rabaul onboard the Laurabada; NX60008 Staff Sergeant Stewart Cameron Caston, executed 4 February 1942 at Tol; NX25197 Cpl Laurence Ashleigh Hudson, stayed at the Army Hospital in Vunapope and was later executed on 1 July 1942; and NX27487 Private (Pte) Frank Harold Hennessy, executed 4 February 1942 at Tol.